By Singyin Lee in Social Media. Updated on May 6, 2016 . Facebook is full of whatever you want it to be full of. If you don’t like to see photos of your friend’s 3 meals-a-day, you can hide it. If you want funny videos, you can follow that particular page. Save the materials that matter, and chuck those that don’t. 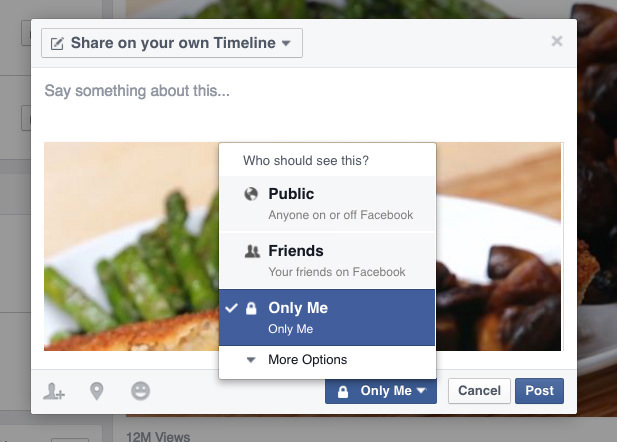 You don’t have to be a victim of over-sharing or Facebook-triggered jealousy. There are plenty of ways to regain some control over what you want, or don’t want, shown on your Facebook feed. Let’s look at some house-cleaning tips that can help you spruce the place up and remove the excess baggage nobody cares for. 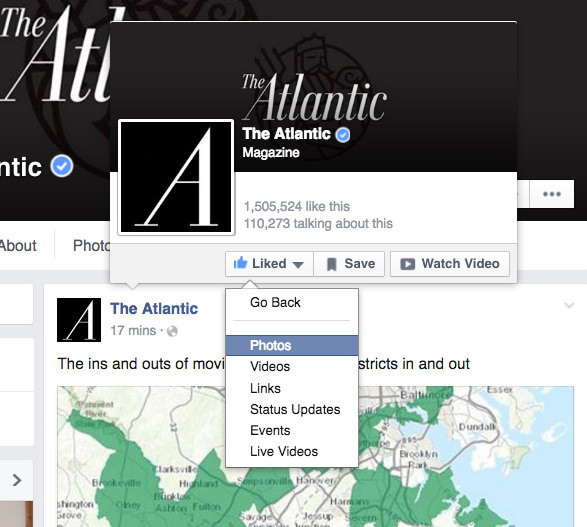 If you see content from a page you like and want to get more, you can subscribe to the page by Liking the page. 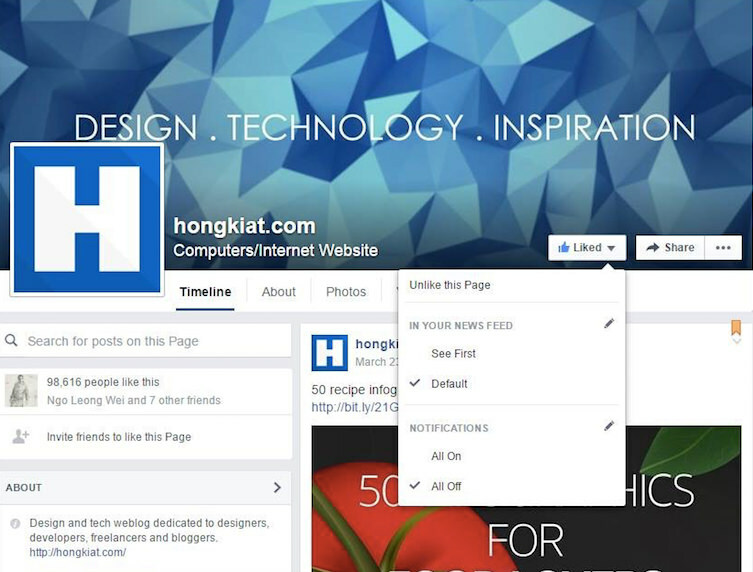 Just search for the page, and when you click to go to the page, you will see a Like button on the cover photo. See First vs Default. See First ensures that everytime you load Facebook, you get the latest post from this page. Notifications All On or All Off. 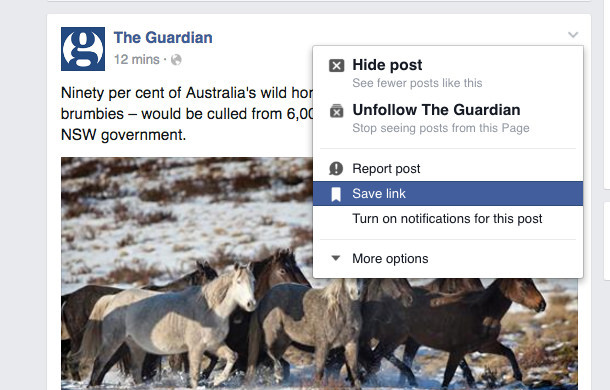 Turning notifications on means Facebook will notify you every time the page publishes something new. If you want the page to stop appearing on your feed click on the Liked button and choose Unlike this Page. The same rules apply when you want to follow a celebrity or public figure, except that you can choose to Send a Friend Request or Follow them, if either of these options are made available. There may be times when a friend or a page you have liked shares something that is unappealing or designed to shock e.g. gruesome images of sick children who "need your likes". You may want to hide just this particular post but not unfollow the friend or page. To do this, click on the arrow down icon on the top right hand side of the box. Choose Hide post. You are still following this friend or page eventhough you hid this one single post. If you want to completely unfollow a page, just choose the next option down the list: Unfollow [page name]. (1) Share the post, but change the Friends to Only Me. (2) Click the arrow down button at the top right hand side of the post you want to save, then click Save Link from the dropdown menu. All your saved links are accessible on the left sidebar, under Saved. 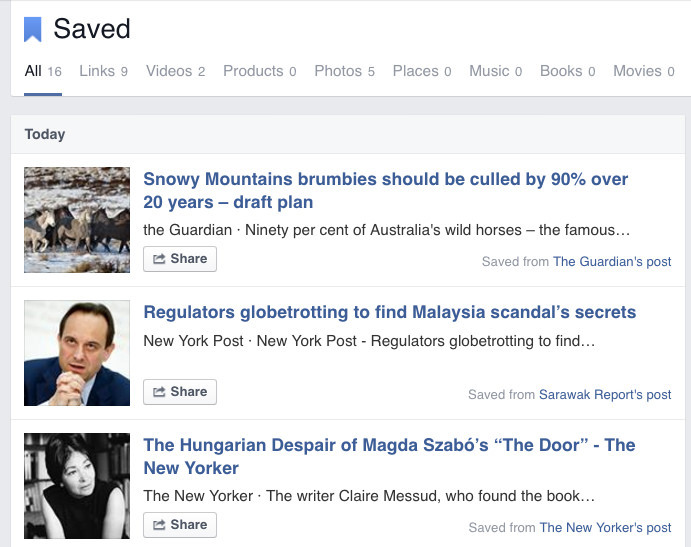 Clicking Saved will bring you to a list of the things you have previously saved. It even categorizes the type of items you saved into Links, Videos, Products, Photos etc. Facebook can send you special notifications that are outside of the usual triggers. 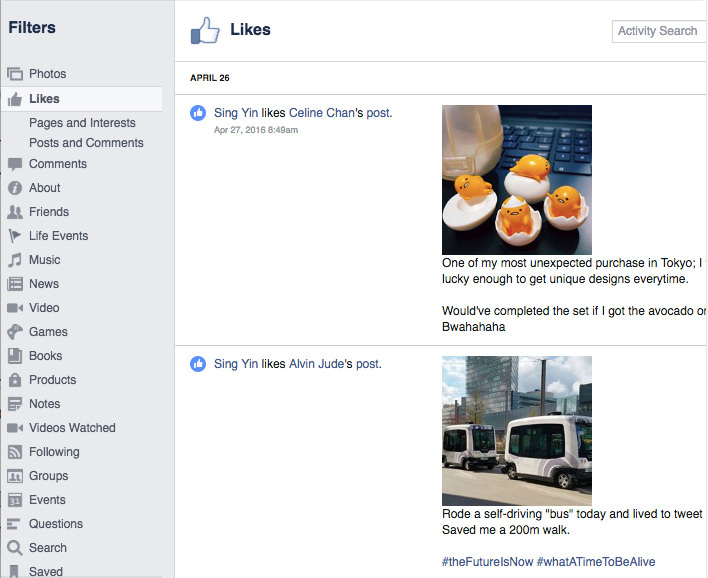 For instance, you can get notifications turned on for a Facebook page or even a friend. 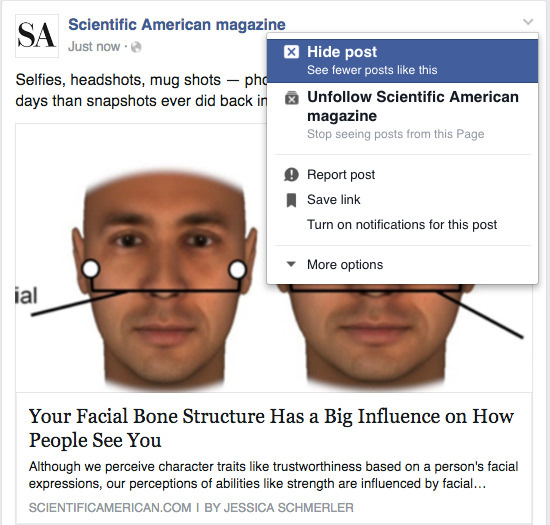 This means that every time the page or your friend posts something new, you get a new notification. (1) To turn on notification for a Page, hover over the page name, and you will see this. 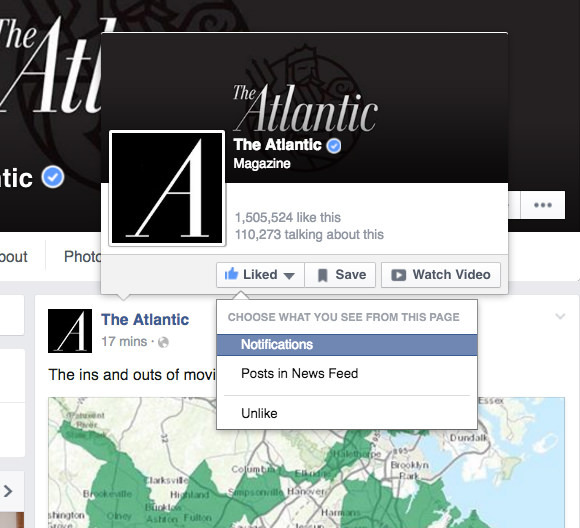 Click on Notifications, then pick the type of shares that what you want to receive notifications for. You can pick more than one. (2) To turn on notification for a Person, hover over the person’s name or go to the person’s personal page and hover over the Friends button. 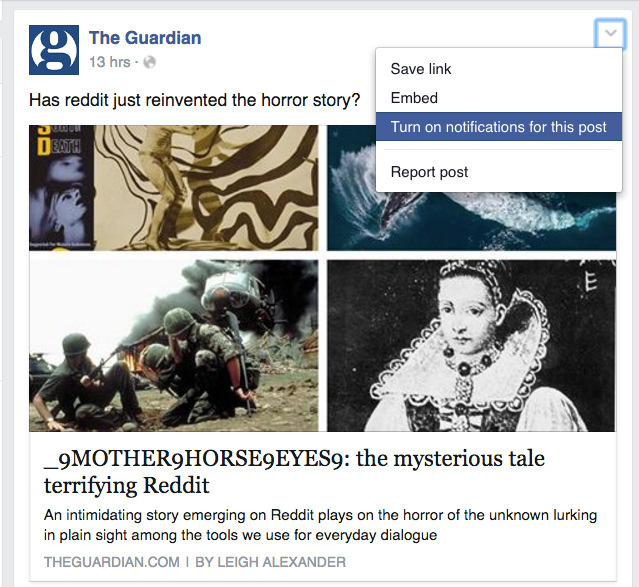 Click on Get Notifications to receive notifications the next time he or she posts something. (3) If you have posted a comment on a public post by, for example, your local newspaper’s Facebook page, and would like to get notification if a fellow reader replied or liked your comment, you can also turn on notification for that specific Post. Click the arrow down button at the top right hand side of the post you want to save, then click Turn on notifications for this post from the dropdown menu. (1) Check who can see your stuff. Here you can set the default audience for your future posts. In this example, mine is set to Friends only. Further down is the View As option which lets you check what your Facebook profile looks like to the public, or to a specific person e.g. 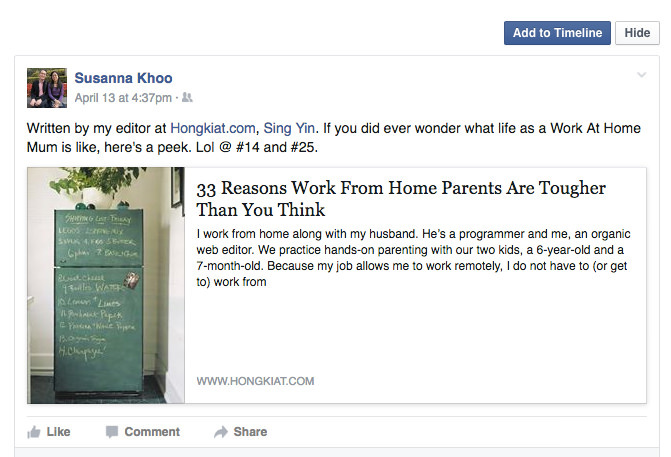 your boss, parents, school teacher (click View As, then in the field, type in their name to see their view). 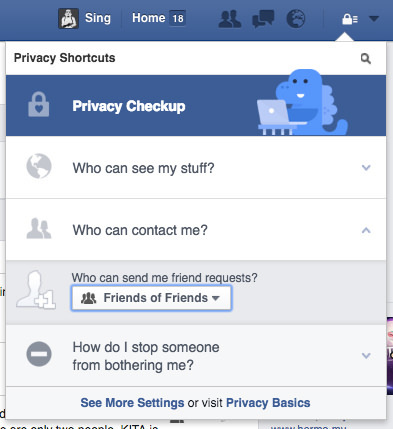 (2) Next is the option to set who can send you friend requests. There’s only the Friends of Friends option and the Everybody option. (3) The third is a who to block option. Just add the name of the person you want to block into the field. This section is an extension to  where we look at how you can further hone your blocking skills. 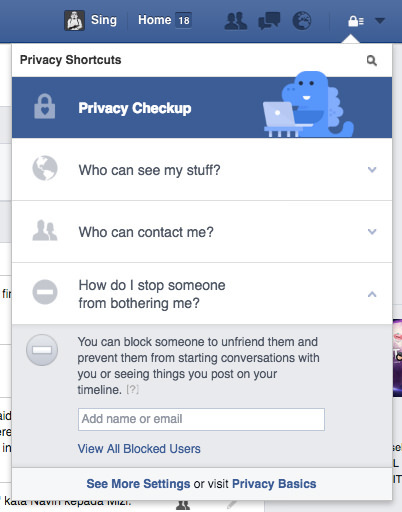 On your Facebook page, go to Settings > Blocking or use this shortcut. The Restricted List. "Friends" you put in here will not be able to see what you post to Friends. They only see what is posted to Public. They are however, still in your Friends list. Block users. The people here are not in your Friends list and cannot reach you. You can however still Unblock them. Block messages. These can still post to your timeline and interact with you on your Facebook wall but cannot send you direct messages via Messenger. Block app/event invites. No game invites or requests for lives and/or game items. No gatherings. Block apps. Nothing app-related will show up on your feed. Block Pages. This is the equivalent to unliking and unfollowing a page. This probably just makes it easier for you to do it in bulk. Apart from Restricted List, the other blocks require you to type in the name of the persons, apps or pages. Autocomplete makes it easier for you to figure out the correct names. (1) On the top right hand side, click on the arrow-down button and click on Activity Log. 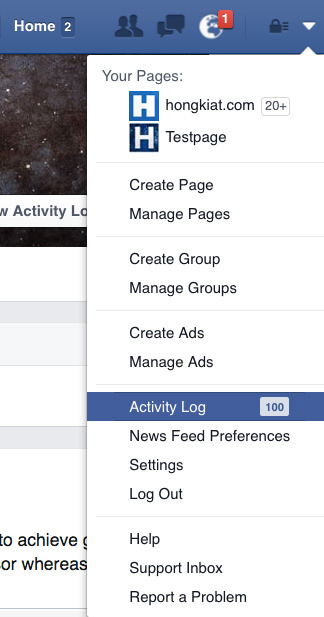 (2) Alternatively, you can go to your personal Timeline and find the View Activity Log button. To jump to a specific year, scroll down a bit and a dropdown menu with the words Timeline and Recent will pop out alongside your name. Click on Recent, then choose a year to go to that year’s timeline. If you don’t want to search manually, you can use the Activity Search function which is accessible with the magnifying glass icon (top right). The search function however can be found wanting, so you might find it easier to find what you are looking for via the Filters. Filter: Activity Log – Here, all that you have shared, saved, reacted to, uploaded, replied, commented, were tagged in are logged in chronological order. Filter: Timeline Review – Here is where you see all the posts you were tagged in. You can also choose whether to add the post into your own Timeline (click on Add to Timeline if you do), or click Hide or leave it alone, to not add it. Filter: Tag Review – If you ever get tagged by a Facebook friend, here is the place where you approve or dismiss the tag. Say for instance, you got tagged in an event photo where you were drinking with your buddies, but your wife didn’t know about it. You will not get tagged on that photo if you don’t approve of the tag here. Use this well. Filter: Your Posts – Here is where you find posts, photos, videos, and links that you yourself have shared. Filter: Posts you were tagged in / Posts by Others – Apart from the photos you were tagged in, here is also where you find any mention of your username. For my account, a lot of the posts in these two filters overlap. Filter: Posts You’ve Hidden – This is the place where all of your dismissed tags go to die, I mean, into storage. Specific Filters – There are more filters that can you let you go deep into your Facebook activity history. For early adopters, this could span more than 10 years so filters like this can help you better locate what you are looking for. The Search bar at the top of the page has evolved through the years to become a rather powerful tool. 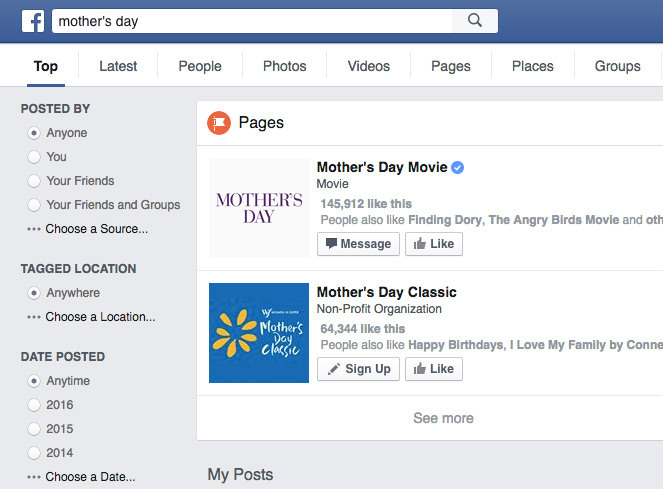 Simply type a query like "Mother’s Day" and you get a mix of results that include pages, events, organizations and the like. The results can actually be broken down some more. 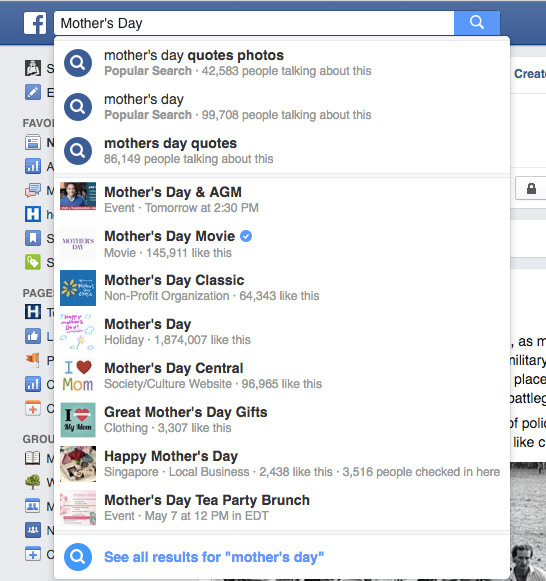 To do that, click on See all results on "Mother’s Day", right at the bottom. You will land on a page like this where you can further refine your search results by Posted By (you, your friends, friends and groups, or choose a specific person), Tagged Location, or Date Posted. You can also pick the categories near the top to further filter the results. Know a friend who is into online shopping and likes a ton of product pages? If you want to tap into that resource, you can, with the search box. 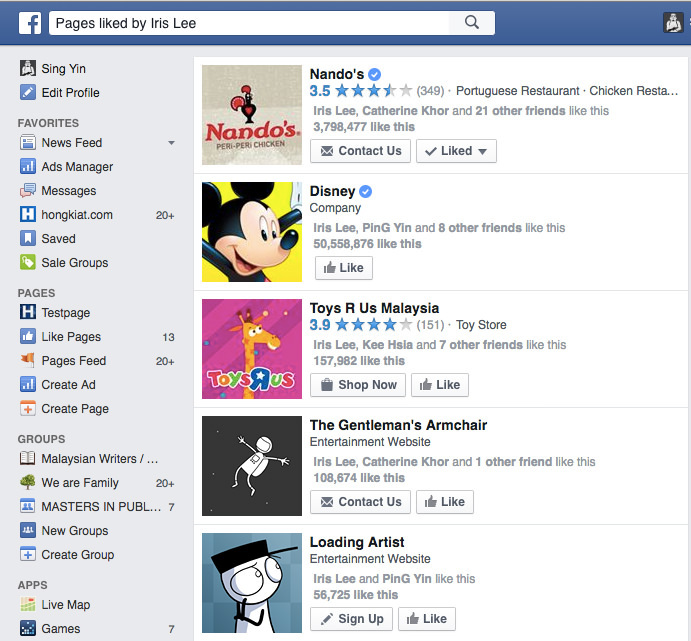 Type Pages liked by [friend’s name] into the Facebook search box and you can see all the pages they’ve liked (recent first). You can filter this further for Public Figures, Groups, Product pages, Company pages, Artist and other Facebook page types. Facebook has quite a number of security options to prevent unauthorized use of your Facebook account. We’ll briefly look at this topic in this section. Because it’s important. All of these features are accessible at Settings > Security or click here. Enable this to get an alert when someone tries to log into your account from an unrecognized device or browser. Note that if you travel and tried to access it via a computer that’s not yours, or if you access it to a newly purchased device, you will get a notification via this. This is a list of 3 to 5 people whom you have entrusted upon the important job of getting you your Facebook account back, if you ever find yourself forgetting the password. I’m not sure how it works but it involves your trusted contacts getting a one-time security code from Facebook and passing it to you so you can regain access to your account. Facebook keeps tabs on the combination of browser plus device you log into. It keeps a record of your most frequently used browser and on which device. If for instance you sell off your smartphone, you can remove the browser you used on that smartphone to prevent the new owner from accessing your Facebook. For some reason, Facebook also keeps log on the location you last accessed your account. If you find that you have logged in from a location that you can confirmed is not you, you can choose to End Activity. Assign someone as your Legacy Contact, who can decide what to do with your Facebook account once you have passed away. There are a few more options like the Code Generator, App Passwords, Public Key and Login Approvals. 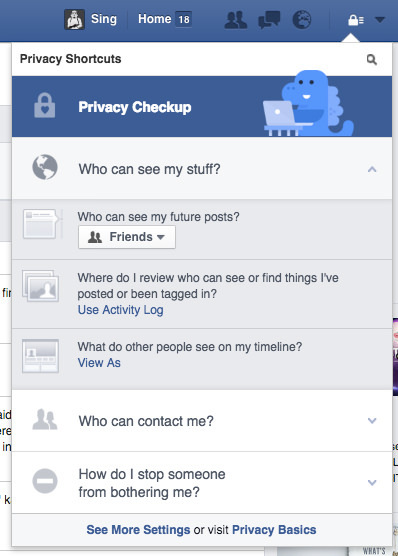 It is up to you to explore these other ways to keep your Facebook account safe.